← Could the general election screw up the Census? It is the height of arrogant presumption of someone to take the result of the next election as read but it is also prudent that someone within an political party need to think beyond the next election towards the next generation. And it should be recognised that there are times when a party’s day in the sun has passed, when it is ripe for toppling from the political mainstream and all it requires is the right push at the right time. 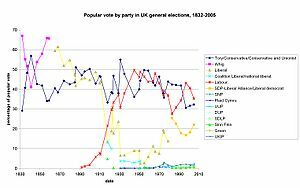 This is what happened to the UK’s Liberal party in the 1920s where the Tories adroitly usher them out and the Labour in as their main opposition. Such a prospect was unimaginable at the end of the first World War that at the beginning of the next war that the Liberal party would be a rump in parliament not to return to government until the dawn of a new century. I’ve previously noted that a problem exists for FF is that who within the party at a point of central control will have the stature or influence to make the hard calls especially on supporting candidates for the future that will save the party from slow oblivion. Let’s face it, it’s not going to be the likes of Jerry Beades that does it. The same question for different reasons has to be asked within FG as to who is thinking both in terms of longer term political goals (policy objectives) and strategy to ensure that FG will be able to play a dominant part in the political discussion of the coming decades. Here are two (perhaps extreme) suggestions I would make (based on conversations I’ve had with others), one is that after the general election and once the new Taoiseach has been chosen by the Dail that the new government should immediately amend the necessary legislation and extend the Dail term to 7 years subject to its re-approval by the Oireachtas again 4 years hence (those not tying the Labour party into a deal for 7 years where they are dependent on the FG Taoiseach’s calling of the general election that they can’t revoke, and with the commitment that the full 7 years will not availed of. This is in part to signal that the work of national recovery will be hard and politically costly but that it will work in the medium term and the government needs the space for. It is an odd feature of public policy that good and effective policy takes much longer to show results than the political system generally allows, so that governments are frequently rewarded or punished for the work of others. FF and the rest of the opposition will be doubtlessly outraged at this move but the new government can simply reply that we are in extraordinary times (which the current government has repeatedly claimed) and that the new government needs and deserves the time to fix the problems caused by a decade and half of mistakes and missed opportunities. With what may be an overwhelming majority this change is the new government’s for the asking. Thus everyone will believe that the next election will be 4/5 years hence or perhaps longer if FG and Labour are agreeable. But then the coup de grace on FF will be that the government should having stabilised the economic situation and with the economy growing once again, even if unemploment will still be high, hold the next general election on the same day as the local and European elections of 2014 seeking a new mandate and with the commitment to revoke the 7 year term provision. FF will simply be unable to field enough new competent or credible candidates. It will be that much hard for new FF candidates to emerge who can run for both Dail and council at the same time. Couple this with the passage of Seanad reforms such that the Seanad is elected on the day as the Dail will also deprive FF of a route back to power. FF will most likely return to the Dail with much the same 30/40 TDs they could have post 2011 and without the gains in new cllrs they wanted in order to rebuild the party at local level and in areas where they are weakest. So FF would be facing another full term in opposition along with the knowledge that they would most likely not be the dominant party in any government they might potentially be part of thereafter. This is likely to cause a crisis of confidence within what was once a self styled political movement and not a mere party, and was the natural path to power for the ambitious person of the political centre. This entry was posted in 2011 and tagged election 2014, Fianna Fail, fine gael, General election, labour, Taoiseach. Bookmark the permalink. Like I said in the link from Facebook – Warning: May contain some wishful thinking as to the long term plotting capacity of the party.